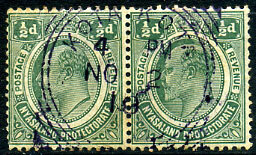 21 NOV 24 on KGV 1d pair (SG.101) piece. 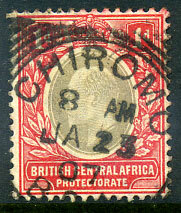 (D2) 18 JAN 38 on KG6 2d (SG.133). 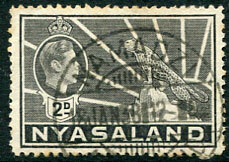 24.6.32 on KGV 1d (SG.101) piece. (D1) OC 27 05 on KE7 1d (SG.2). (D3) dated 13.5.21 on horiz. 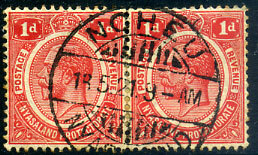 pair KGV 1d (SG.86), corner crease. (D8) 21 MAY 46 on KG6 6d (SG.150). 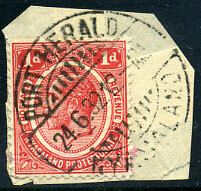 (D5) in purple dated NO 2 10 on horiz. 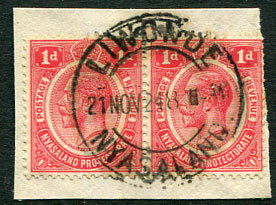 pair KE7 ½d (SG.73), left stamp with two creases. 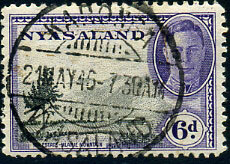 OST AFRIKANISCHE SCHIFFLINIE dated 28.5.12. (D5) JA 23 07 on KE7 1d (SG.59).